Invest in a battery case and you can avoid this problem as well as giving your phone some extra protection at the same time. There are dozens of great options, so to save you the shopping legwork, we've picked out some of the best cases for iPhones and Androids. Weighing up the tradeoff between battery and bulk? The Moshi IonSuit offers the best of both worlds if you don’t need a 24/7 boost. This two-part system has a detachable battery pack that slips over a slim, shockproof case. The internal cover offers drop and scratch protection, and the smooth outer promises multiple battery charges with 3,020mAh of power. It’s an investment piece, but it ticks the boxes for both form and function. This slim battery case not only triples your iPhone 6, 6S, 7 or 8 battery, it’s got an extra USB port so that you can charge a second handset at the same time. The internal flannelette coating protects your primary phone from scratches and the rear LED indicator lets you know how much juice you’ve got left in the tank. Mophie has been in the battery case game for a long, long time, and it shows in the quality of its products. There are several Mophie cases to pick from but we particularly like the newest entry in the range, the Juice Pack Wireless plus charging base, available for the iPhone 6, 6S, 6 Plus and 6S Plus. As the name suggests, you get wireless charging capabilities alongside another 1,560mAh of battery power, so you only need to pop your iPhone down on the base for it to start recharging. It's a case that really looks the part too, though black is your only choice as far as available colours are concerned. Maybe you don't care about wireless charging, but you do care about some serious protection for your phone, in which case we'd recommend the OtterBox Resurgence Power Case, available in black, silver, red and pale green and compatible with the iPhone 6 and the iPhone 6S. The case is packed with a 2,000mAh battery and drop protection technology developed from 238 hours of testing. There's also a charge LED light so you know how much juice is left, and the case automatically stops charging your phone once it's topped up, saving the battery life for when you really need it. 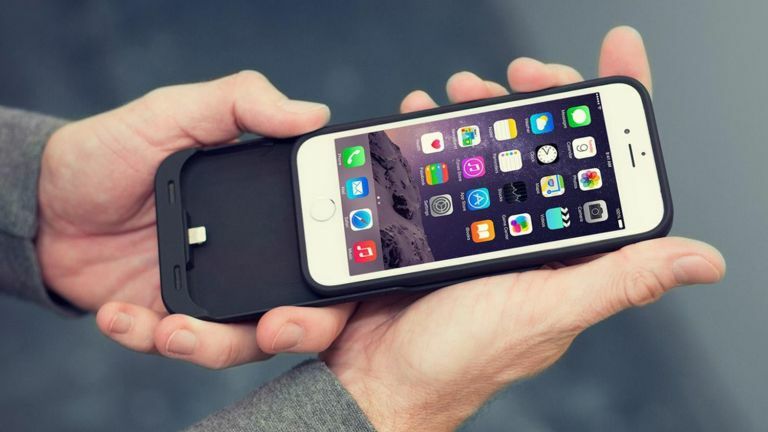 With a massive 3,200mAh battery, the option to use the case with or without the battery pack attached, LED status lights and compatibility with the iPhone 6, iPhone 6 Plus, iPhone 6S and iPhone 6S Plus, the Energi Sliding Power Case from Tylt is a comprehensive (albeit expensive) battery case. Its appearance is fairly unremarkable and you only get the choice of one colour - black - but it looks fine to us, and that raised bezel on the case keeps your precious iPhone safe from drops. If you're looking for a no-nonsense battery case that fits Apple's 2014-2015 flagships, this is a solid choice. The Incipio Offgrid Express case wraps around your iPhone 6S or iPhone 6 and gives you a hefty 3,000mAh of extra juice - according to the people who make it that's enough to more than double your iPhone's battery life. It's perhaps not the most stylish of phone cases but you get seven colour choices to pick from, which should be enough to cater for just about everyone's tastes: black, grey, pink, quartz, white, gold and mint green. Apple's own Smart Battery Case might not be the best-looking or most feature-packed option out there, but it's made by Apple's engineers - so you'd like to think they know what they're doing when it comes to iPhone cases. Available in white or charcoal grey for both the iPhone 6S and the iPhone 6 (there's no love for the bigger models), the extra 1,877mAh battery promises up to 20 extra hours of video playback, enough for even the longest journeys. This ultra-thin case is a budget battery winner. Exchange 4mm of extra bulk for 2600mAh of battery power, and pay less than £25 for the privilege. The slick one-piece design has a a flexible bumper for drop protection and an internal steel plate that snaps seamlessly to magnetic mounts. A case that fits a wide variety of phones, the Power Pouch from Emtec is more of a wallet-style holder that a case that fits every nook of your handset, but for some of you that will be ideal. Here's something else in the Power Pouch's favour: a 6,000mAh battery, the second-largest in this list. We've put this in the Android list but such is the versatility of the Power Pouch you can use it with iPhones too (you get both Lightning and microUSB adapters when you buy one). Of course there's the added benefit of not having to change your battery case when you next upgrade your smartphone. 4,000mAh of power to draw on, a slimline fit, and a rock bottom price - there's a lot to like about this Slim Rechargeable Extended Battery Case. The model shown is for the Galaxy S6 but if you shop around you'll find different variations made to work with several of the top Android phones on the market. There's an LED power indicator here too and it doesn't interfere with any of the NFC or infrared functionality on the phone. According to the manufacturer you can get at least double the battery life of your phone with this case attached, and it's one of the more impressive Android options out there. Back to Mophie and the company makes battery cases for Samsung Galaxy phones as well as the iPhone models we mentioned further up this page. For your money you get a 3,300mAh battery that provides up to 11 hours of extra video playback on your phone (by Mophie's measurements anyway). The case adds wireless charging capabilities if your phone model doesn't already have them and it will work with just about any wireless charger on the market - very handy if you have one lying around. Plus, it looks sleek and smart, and has integrated LED lights so you can keep an eye on the charge level. If you own a Google-Huawei Nexus 6P and value battery life above form and function then the Nexus 6P Battery Case from ZeroLemon has you covered: it packs in a huge 8,500mAh battery which should theoretically keep your phone running all weekend, so it's perfect for travellers and explorers. There's no getting away from it though, this is a pretty chunky case. Still, its bulk means a lot of protection for your handset, and all the ports remain accessible (including the fingerprint sensor around the back). It's shockproof and there's an LED charge indicator and power button on the rear. If you want the best kit for your phone then it's sometimes best going down the official accessory route. Enter the Galaxy S7 Wireless Charging Battery Pack from Samsung, perfectly contoured to the shape of Samsung's latest flagship handset, and offering 3,400mAh of extra battery juice. The case also doubles up as a wireless charging pad, so when you're at home you can charge up both phone and case together. The underneath of the case is left relatively uncovered, which means you can easily get at the headphone port and the microUSB charging port when you need to. Charging-experts Powerbear have made it their mission to eliminate low battery panic. Their range of matte black battery cases for Samsung, LG and iPhone handsets sport simple lines and deep bevels to shield rear cameras. The Samsung Galaxy S8+ case offers 4500mAh battery life and includes a screen protector for added piece of mind. Charge the case and the phone at the same time and simply push the ‘on’ button to transfer juice to your handset on the go. Bovon’s highly-rated battery cases offer extended battery life at affordable prices. The four-level LED power indicator doubles as an ‘on-off’ switch and changes colour as the case runs down. The flexible shell offers bump protection, an internal magnet clips to your in-car phone holder and there’s a bevel over the rear camera to protect the lens from scrapes.